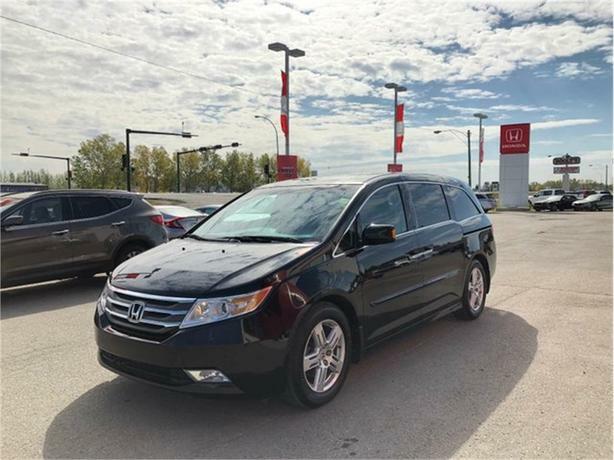 This practical yet luxurious 2011 Honda Odyssey Touring takes the minivan segment to a whole new level. The "Crystal Black" exterior is in excellent condition paired with a grey leather interior. The 3.5L VTEC engine has loads of power to haul you and your precious cargo around while still rewarding you with 8.7L/100KM on the highway. This Odyssey has been regularly serviced and maintained. For your peace of mind, our certified technicians performed an extensive multi-point, comprehensive used vehicle inspection on this vehicle. other than an oil & filter change, a wheel alignment, new front rotors and a few other maintenance items, nothing more was needed to ensure this quality FWD is in optimal driving condition and more than ready for its next proud owners! The aerodynamic exterior design of our Odyssey adds style as well as function. Get behind the wheel and you may think you're in a luxury sedan! Designed with your busy family in mind, the interior features child-friendly power-sliding doors for quick school drop-offs. A multi-adjustable second-row seat and 60/40 split-folding third-row seat accommodate your growing family. Other amenities include a leather-wrapped steering wheel with illuminated controls, multi-angle rearview camera, tri-zone automatic climate control, a prominent sunroof. Now settle into your heated leather seat, check out the satellite-linked navigation with voice recognition, crank up your favorite tunes, and get going! Oh, and don't forget about the rear DVD system to keep the little ones entertained.